Who is killing monks in a great medieval abbey famed for its library - and why? Brother William of Baskerville is sent to find out, taking with him the assistant who later tells the tale of his investigations. Eco's celebrated story combines elements of detective fiction, metaphysical thriller, post-modernist puzzle and historical novel in one of the few twentieth-century books which can be described as genuinely unique. The Name of the Rose was made into a film in 1986, starring Sean Connery and Christian Slater and directed by Jean-Jacques Annaud. 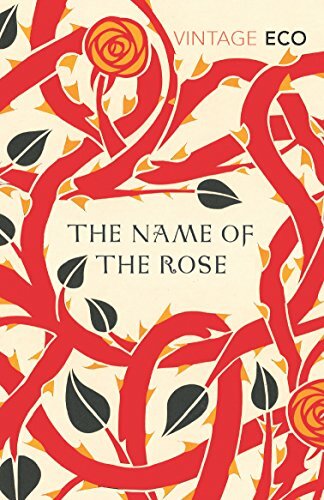 Originally published in 1980 as Il nome della rosa, Eco’s first novel has rapidly assumed the status of a modern classic. 1980 Il nome della rosa. Milano: Bompiani (Commented edition, ed. by Costantino Marmo. Milano: Edizioni Scolastiche Fabbri, 1990). Le nom de la rose. Paris: Grasset, 1982. Der Name der Rose. Munchen: Hanser, 1982. El nombre de la rosa. Barcelona: Lumen, 1982. Rosens Namn. Stockholm: Brombergs, 1983. De Naam van de Roos. Amsterdam: Bert Bakker, 1983. O Nome da Rosa. Lisboa: Difel, 1983. O Nome da Rosa. Rio de Janeiro: Nova Fronteira, 1983. Rosens Navn. Copenhagen: Forum, 1984. Rosens Navn. Oslo: Tiden, 1984. Numele trandafirului. Cluj-Napoca: Dacia, 1984 (revised ed. Bucuresti: Polirom 2002). Ime roze. Ljubljana: Mladiska, 1984. Ime ruzie. Zagreb: Graficki Zavod Hrvatske, 1984. Nafn Rosarinnar. Reykyjavik: Svart ahvitu, 1984. To onoma toy rodoy. Athenai: Ekdosei Geose, 1985. El Nom de la Rosa. Barcelona: Libres a Óm, 1985. Imeto na rozata. Sophia: Narodna Kultura, 1985 Sophia: Bard 2002). Der Name der Rose. Berlin: Volk und Welt, 1985. Gulun Adi. Istambul: Can Yayinlari, 1986. Now, Warszawa: Noir sur Blanc 2004 and Kolekcja Gazety Wyborczej 2004. Shem ha-vered. Tel Aviv: Zemora Bitan, 1987. Iméno ruze. Praha: Odeon, 1988. Praha: Simom and Simon, 1999. Imja ros'i. Inostrannaja Literatura 8-9, Moskow, 1988. A rozsa neve. Budapest: Europa Könyvkiado, 1988. Bara no namae. Tokyo: Sogensha, 1990. Tên Gùa Dóa Hông. Thàn pho H Chì Minh, 1989. Meno ruze. Bratislava: Tatran, 1991. Bratislava: Vydavatelstvo Slovart, 2000. Rozes vardas. Vilnius: Leidykla Alna, 1991. Janmiui Irum. Seoul:Open Books, 1991. Umja ros'i. Minsk, Scaz, 1993. Emri i trandafilit.Tirana: Botimet 'Elena Gjika', 1996. Roosì nìmì. Tallinn: Eesti Raamat, 1997. (Thai translation) Sl: Kobfai, Sd. Ime Ruže. Beograd: Paideia 2000. (Chinese tr., simplified characters) SL: Zuoija Chubanshe 2001. Eilse päeva saar. Tallin: Eesti Ramat 2003. 1983 Postille al nome della rosa. Added to the pocket italian edition, 1984. Nachschrift zum NdR. München: Hanser, 1984. Postscript to The Name of the Rose. New York: Harcourt, 1984. Pós-escrito a ONdR. Rio: Nova Fronteira, 1984. Naschrift bij DNvdR. Amsterdam: Bakker, 1984. PS till RN. Stockholm: Bromberg, 1985. Apostillas a ENdlR. Barcelona: Lumen, 1985. Efterskrift til RN. Copenhagen: Forum, 1985. Reflections on the Name of the Rose. London: Secker, 1985. Epimythio sto Onooma toy Rodoy. Ekdoseis Gnose, 1985. Szeljegysetek a Rozsa Nevèhez. In Nagy Vilag, 1987/4. Randbemerkinger till Rosens mavn. Oslo, 1998. Apostille au Nom de la Rose. Paris: Grasset. Porque O Nome da Rosa? Lisboa: Difel, s.d. Bara no namae oboegaki. Tokyo : Jiritsu shobo 1994. Changmi ui irum changjak note. Jangumiui Irum Ch’angjak Note. Seoul: T`ukpyolsi: Yollin ch`aektul 1993. Sametki na lorjah ‘Imeni ros’i. Saint Petersburg: Symposium 2002. Järelkiri Roosi Timele In Akadeemia 6 (Tartu). 2004.